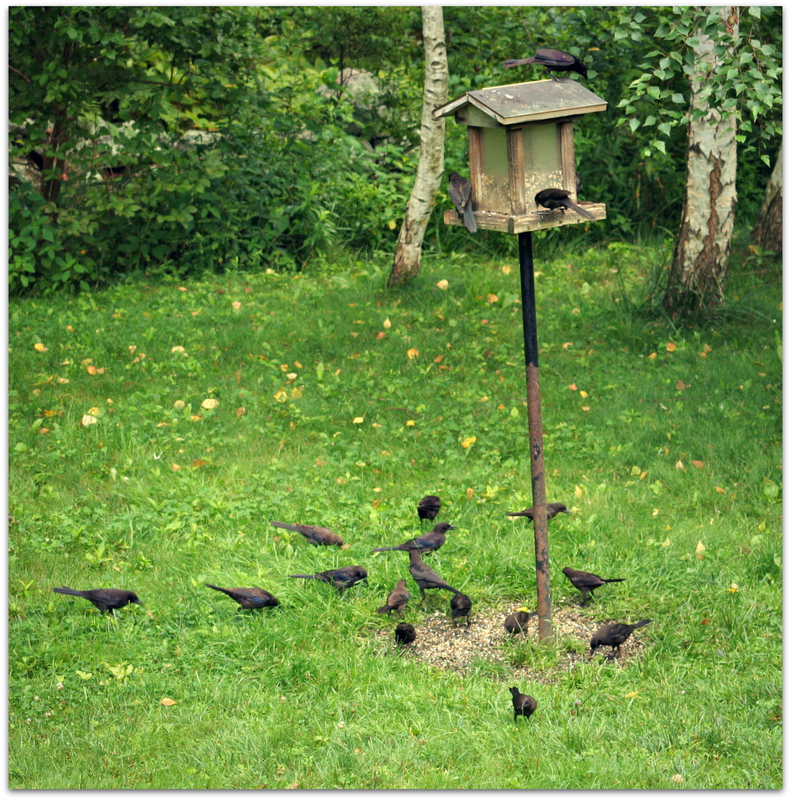 Do you wish to attract lots of wild birds to your backyard? Be careful what you wish for. For nearly a week a large flock of noisy Common Grackles (this is less than half of them) has been swooping in four or five times a day to gobble LOTS of seeds, nuts and suet, bother other birds, and poop purple and white grackle poop all over everything. Wikipedia: Grackles tend to congregate in large groups, popularly referred to as a plague or annoyance. This enables them to detect birds invading their territory, and predators, which are mobbed en masse to deter the intruders. This morning after cleaning chicken poop out of the chicken coop, I hosed grackle poop off the deck and patio and chairs and hot tub cover. I remembered how much I wanted to work at the zoo when I was a kid. Cornell: During migration, set up bird feeders in your yard with a variety of mixed grain and seeds. Spreading grain or seed on the ground helps, as this is where Common Grackles prefer to feed – and if they come to the ground they may let smaller birds continue to use the feeders. Bear in mind that too much grain scattered on the ground can attract rodents, so it’s best to sprinkle just as much as the birds are likely to eat at any one time. I don’t need to scatter it – they do that themselves! We always have squirrels and chipmunks but this year a surprising number of rabbits have been making themselves at home under the bird feeder and in the clover. One brown rabbit was in the chicken run when I put the chickens in last night. It couldn’t figure out how to exit the open door and kept crashing into the wire mesh of the enclosure. I wavered between helpfully shooing it out and catching it so I could pet it and feel its soft rabbit fur. The chickens chased it out before I could decide. P.S. What is it with grackles and wishes? This entry was posted in Uncategorized and tagged birds, Common Grackle on August 12, 2014 by Amy.